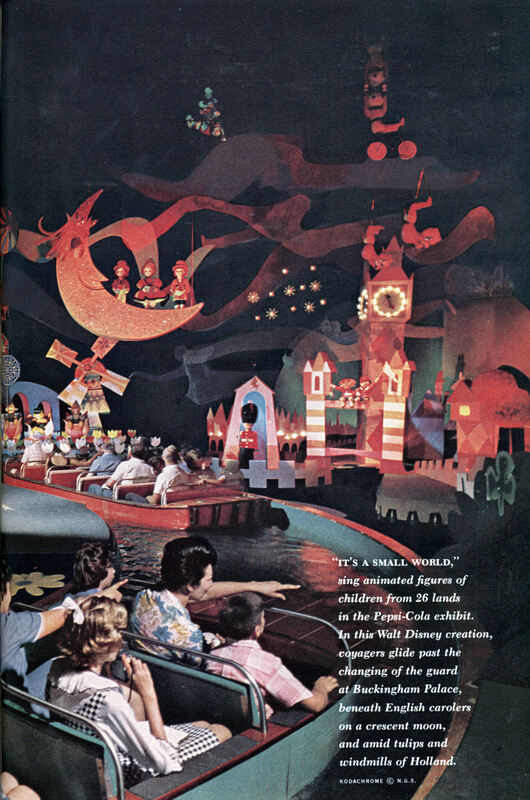 Very cool 25 page photo spread of the World’s Fair from a 1965 National Geographic. Check out the odd assortment of items in the time capsule on page 22 (larger view). Among other things it has a rather clunky looking computer memory module, birth control pills, a pack of cigarettes and a bikini. This is the New York World’s Fair of 1964-1965. Here you can see how atoms collide in the first public demonstration of controlled nuclear fusion, at General Electric. Listen to the rustle of stars as picked up by a radiotele-scope at Ford. Take a journey into space, booked by the Martin Company in the Hall of Science. See how your voice “looks” on TV at the Bell System (page 515). Sample the sights, sounds, and smells of faraway lands in the pavilions of 66 nations. Admire masterpieces: El Grecos and Picassos at Spain; Michelangelo’s “Pieta” at the Vatican Pavilion. See an automobile assembly line in action at Chrysler. Watch the Nation’s population grow at Equitable Life Assurance. Rest in the Garden of Meditation or find inspiration in the music of the Mormon Tabernacle Choir. See children playing in Denmark’s model of the Tivoli Gardens or wondering at people disappearing in General Cigar’s Hall of Magic. Watch a Japanese troupe dance to exciting new rhythms combining traditional music and jazz. Walk down a street in Hong Kong at Coca-Cola. Dine in a tree house on dishes from Africa. Thrill to Polynesian fire-dancers or Mexican flyers (page 512). Sip Irish coffee in the House of the Emerald Isle. In the entrance court of the Pavilion of Ireland, I paused before a huge map splashed at their counties of origin with the names of Irish families. A mother, father, and two small sons stood by in rapt attention as a voice boomed name after name in the inimitable accent of Ire-land. When the name McCarthy was called, the mother spoke: “Now you’ve heard it, we can move on.” Clearly, the McCarthy family had just passed by. Pick up the name of a pen pal from the Parker Pen Pavilion; study the history of life on earth and the progress of man in the dioramas at Travelers Insurance; test your driving skill at Socony Mobil. puppets, “Les Poupees de Paris.” Stroll through the recreated Belgian Village. Plunge down a roaring cataract in the Log Flume Ride. Hi! Ho! Come to the Fair. Some 7,000 visitors file through the RCA Pavilion each day to see themselves on color television (below, left) and hear a backstage briefing on the technological magic that splashes rainbows on their living-room screens. On the same site 26 years ago, RCA introduced black-and-white television to the United States. Official color TV center for the Fair, RCA telecasts news announcements, interviews with visiting dignitaries, highlights of other exhibits, and special eventsâ€”more than 2,000 program hours from April to October. The pavilion also helped reunite families last year by showing lost children on some 200 television sets in buildings throughout the grounds. At the Dupont Pavilion, science joins showmanship (center). Here colorless liquids mixed in flasks shine with intense blue light in a demonstration of chemiluminescenceâ€”the same phenomenon that makes fireflies glow. In Dupont’s production, “Wonderful World of Chemistry,” live actors sing, dance, and talk with life-size motion-picture images on movable screens. One scene shows a live performer blowing out candles on a filmed birthday cake and spraying another actor with frosting. Eight different troupes, working simultaneously in two theaters, present the Dupont show 48 times daily. dinosaurs lumber through swamps, crane necks, and fight as if to death. A Walt Disney technique known as Audio-Animatronics gives them sound and movement. Centuries slip by and cave men appear, make fire from the friction of sticks, hunt animals, paint on cave walls, and invent the wheel. Leaping into the future, Ford creates a gleaming Space City and sends the riders sailing above it like astronauts. General Motors’ Futurama (below) begins and ends in the “near tomorrow. ” Seated in moving sound-equipped lounge chairs, guests fly to the moon. Here a lunar crawler on globular wheels rolls toward a fluted communications center. Other Futurama scenes show man using a year-round harbor in the Antarctic ice, cavorting in an undersea resort hotel, and felling trees in the jungle with a searing laser beam. “America is never accomplished,” announces the inscription at the entrance to the Federal Pavilion (right). And the huge fiberglass-walled structure, “floating” 18 feet above the ground on four steel columns, offers exhibit after exhibit in proof of a Nation in the turmoil of growth. The theme, “Challenge to Greatness,” acknowledges the problems of the land and shows how they are being met: Urban renewal revitalizes a blighted city; new highway networks speed the ever-increasing flow of traffic. “Voyage to America,” a film, illustrates the contribution of immigrants. For a second film, “The American Journey,” moving grandstands carry passengers through the Nation’s history by means of 120 screens. Varied as the myriad products of today’s technology, the contents of the Westinghouse Time Capsule will tell our descendants five millenniums hence of changes that have occurred in the fateful 25 years since the original Time Capsule was buried at the close of the 1939 World’s Fair. Dr. Leonard Carmichael, your Society’s Vice President for Research and Exploration (right), chaired a committee of distinguished scientists, artists, and scholars who selected the capsule’s historic freight. The Bible, a piece of heat shield from a space craft, a National Geographic Atlas of the World in microfilm, freeze-dried food, a bikini bathing suit, and a popular recording by the Beatles comprise a portion of the material that also includes microfilmed writings totaling 20,000,000 words of text. The gleaming torpedo-shaped 1964 capsule (below) will rest under a granite marker only a few yards away from its 1939 predecessor. An inscription enjoins finders to leave the capsules undisturbed until the full lapse of 5,000 years. BY noon of a summer’s day the Fair’s four parking lots swarm with cars. As many as 200,000 visitors a day thronged the grounds last year, and officials now brace for similar invasions. How electronic computers copy human reasoning to solve great and vexing problems. IBM’s ingenious kaleidoscope, a sampling of life and living, lets viewers probe the mind of a racing-car driver speeding at 120 miles an hour, share the problems of scientists gathering weather data throughout the world, watch a football play analyzed by the coach on a blackboard and run by the team, and explore a woman’s mind as she plans the seating of a dinner party. Having witnessed the method in the thought processes of these decision-makers, spectators thus can better understand the methods that “information machines” follow. New york state’s Tent of Tomorrow, 2,000 tons of laminated fiberglass and steel (right), covers a 130-by-166-foot terrazzo version of a Texaco road map of the Empire State (below). Here an audience gathers for a performance of amateur talent. On the mezzanine, visitors may write a law to be forwarded to Albany, the state capital, for study. Pavilions of the 20 other states represented at the Fair compose a hymn to the Nation’s diversity. Illinois houses a life-size talking Lincoln. West Virginia’s artisans make banjos one month, quilts the next. Florida stages a porpoise aquacade. At the Wisconsin Pavilion, an angler may fly-cast for trout and see his catch cooked. Oklahoma displays a map on which a toy barge moves along a proposed ship canal leading to the Gulf of Mexico. At the Maryland Pavilion visitors stroll a wharf, eat crab soup, and watch a model of the Constellation float in a miniature Chesapeake Bay. Montana, the Big Sky Country, shows off a million dollars in gold nuggets. New Jersey hatches chicks and displays the inventions of Thomas A. Edison. Louisiana’s Bourbon Street swings with jazz bands. The swish of hula skirts accompanies guitar and ukulele music at the Hawaii Pavilion. Minnesota sponsors a restaurant with such dishes as venison and duck. Alaska inhabits an igloo-shaped pavilion and entertains with dances by Eskimos and Indians. Missouri remembers Charles A. Lindbergh with a replica of his plane, The Spirit of St. Louis. New Mexico re-creates an adobe village and fills it with Indian handicraft. And the six New England states, Massachusetts, Connecticut, Rhode Island, Maine, Vermont, and New Hampshire, band together to offer a Country Store, a Village Green, and a Liberty Tree hung with historic documents. The land and its people stand exposed in the pavilions of these United States. Yet, what does it all mean? Only what the Fair itself proclaims: that the earth is small and its peoples forever intertwined. Lindbergh flew to France; New York’s law evolved from concepts in Rome; Hawaii draws strength from Polynesian origins; all New England owes a debt to Great Britain. Thus is fashioned the unbreakable chain that binds all mankind. 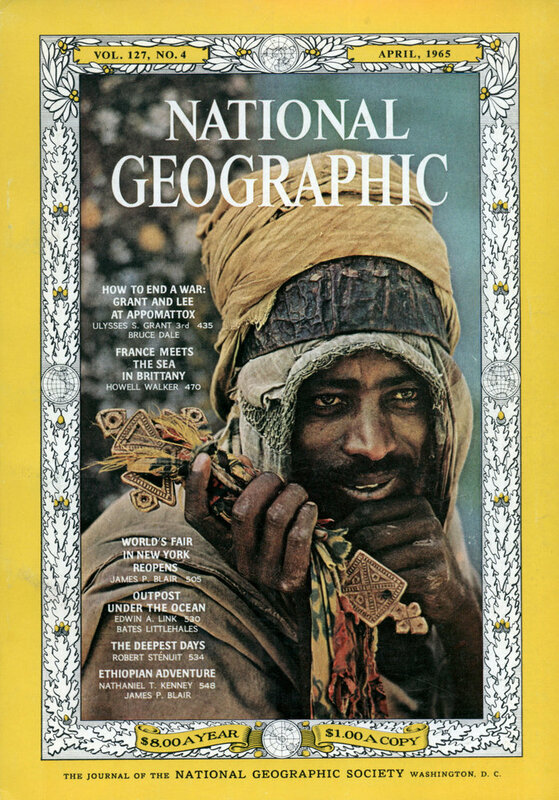 25 pages of New York World’s Fair, National Geographic 1965 – Pictured here, the visible speech translator… Link……. Whatever happened to the time capsule they placed there. I was there in 1964 and recall my family and I signed it. Is there anyway to find the contents of said time capsule ? I went there, Iread the publictions. I experianced this first hand. I want to know more! This is a very important part of my life! The 1964-1965 New York Worldâ€™s Fair’ which I find really explores lot of what the fair grew to symbloize: the hope for the future. Donald Trump built a big shadow-maker windows-only apartment skyrise on the lower left corner of Central Park, last decade. He had a nice looking miniature model sculpture of the earth from the fair site placed there too. It’s now part of the Queens Museum of Art. What these days comes close to that is Google Maps, which has a tab for showing buildings in shadowed but architecturally detailed format. A non-doer is very often a critic-that is, someone who sits back and watches doers, and then waxes philosophically about how the doers are doing. It’s easy to be a critic, but being a doer requires effort, risk, and change…. So let me get this straight: There is a lot of microfilm in the time capsule… but no microfilm reader. A Beatles 45, but no record player. I guess the laundry soap is to wash the bikini. this was magical i am one who is now old enough to go back and revisit i was there too..thank you not enoough info for us to see. Produced a 90 minute documentary on the 1964 World’s Fair which includes a 2nd bonus disk. Available at www.filmbaby.com. Robert Munn & Sara Cook of the Depthography group will be presenting a 3-D stereoscopic projection show of View Master images from World’s Fairs. The events that will be featured (in full color) include the following: 1939 New York, 1939 San Fransisco, 1958 Brussels, 1962 Seattle, 1964 New York, EXPO ’67, 1964 New York aftermath, ruins, etc. Over 400 Views will be featured!!! The event will take place 6PM Saturday, September 27th at the Gershwin Hotel in Manhattan. This is just the latest in a series of 3-D projected events by Munn and Cook at The Gershwin as part of Neke Carson and Michael Weiner’s weekly Cabaret events at the hotel. Other 3-D shows they have presented include WW1 original glass slides photographed in the trenches in France in 1914, famous American historical figures, 60’s tv shows, etc. Munn and Cook are artists who have been creating in various 3-D media of for over 25 years. The photography on these Viewmaster reels were shot on Kodachrome which retains beautiful color over the decades since these reels were produced. The Gershwin Hotel is located on 27th street between 5th Ave.and Madison Ave. The admission fee is $10, which includes 3-D glasses. For further info, please go to http://www.depthography…. This is a hotel which I an sure does not exsist or exsist under a defferant name. In 1964 I stayed in it as a child. I hope that you can find out some information on it. do you have a photo of this map at the world’s fair. if so how can i get it. There is a 90 minute 2 DVD set about the 1964/65 New York World’s Fair available at www.filmbaby.com. It took the producers 14 years to produce. Included are interviews with Ken Snelson, Philip Jonhnson, The Sherman Brothers, Marty Sklar and many many others. This is rare behind the scenes look at this great and possibly the last of the old real time world’s fairs. the 2nd DVD contains footage over from the first disc as well as all the newsreels about the Fair. We went to the World’s Fair as a 16 year old child. Can’t remember the name of the hotel we stayed in. Is it possible for you to send a list of the hotels that were there at the time. It was a semi fancy one. Thanks for your help. Barbara McKell: Yeah, we’ll get right on that. I believe I saw Sam the Sham and the Pharoahs playing at the 65 Fair. Was wondering if they did in fact play there and on what date. I was only 7 at the time. Dave Cristaldi, You saw Sam the Sham & the Pharoahs then? Hey! That’s good! Look at page 20 of 26. The Confederate flag was flying. When did political correctness destroy our once great nation? Obviously sometime after 1965. Colton Rutherford » At least hyperbole is alive and well. I don’t think you know what the word “destroy” means. Colton – How about good taste prevails these days. I remember going to the Worlds Fair in 64 and 65, it was so huge, there was no way you could take it all in in one day. I lived in Brooklyn,NY at the time and moved to Maryland in 1968. It is amazing that there was an exhibit with dummies sitting at computers and it said that in the next 40 years shopping would be done with computers. I really could not imagine that!! But we are doing just that. Also, it said there would be screens with your telephone so you could see the person you were talking to as well..I could not comprehend that either at the time…it seemed so far fetched.